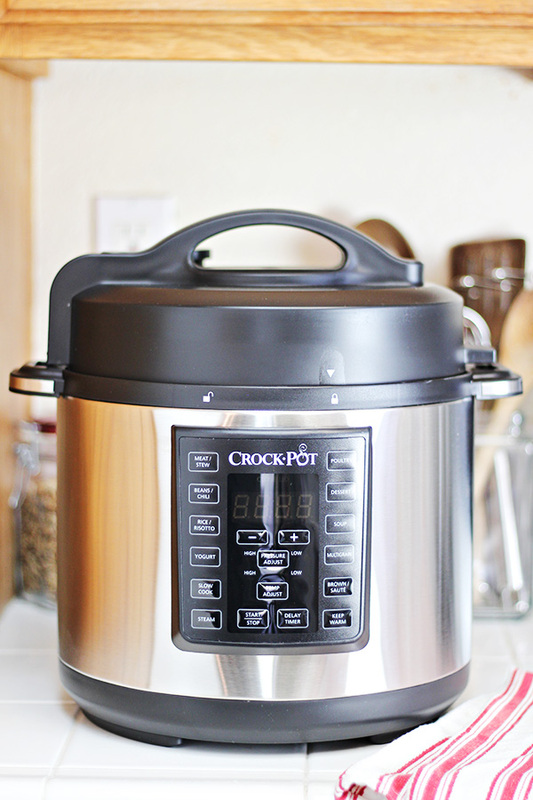 Pressure cookers are one of the best ways to save time in the kitchen! 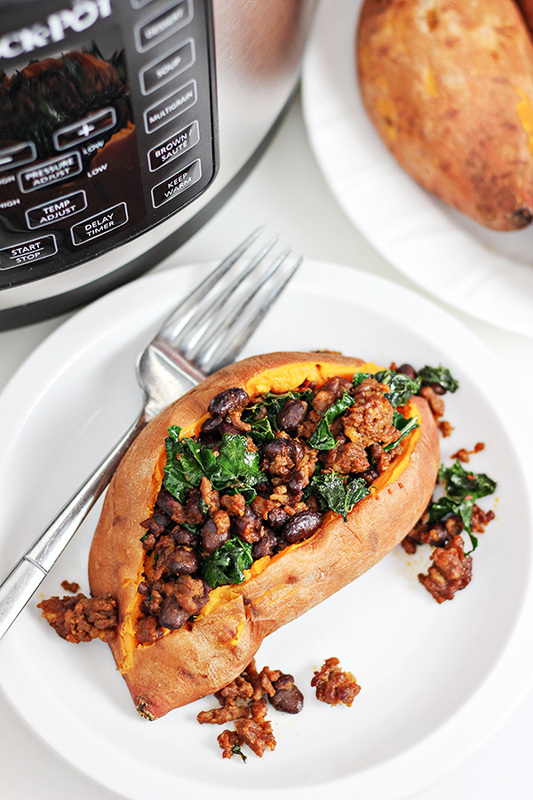 This Crock-Pot® Pressure Cooker Chorizo and Kale Stuffed Sweet Potatoes recipe is incredibly simple to make and absolutely delicious. It uses only a few ingredients and is the perfect meal for a busy weeknight. We just got back from a vacation to Portland & Seattle. We had the most amazing time and didn’t want it to end. But, at the same time, getting back home was nice. Good to be back in our own beds, good to get out of the car (we drove there and back), and good to get back to our usual schedules. The #1 must on my list for getting back to routines was creating a menu plan. It wasn’t easy — the refrigerator was bare and I was exhausted from the trip. Busy days were ahead and with the holidays coming, it was only going to get crazier. I didn’t want to think about cooking, let alone even plan out the meals. To keep things as easy and timesaving as possible, I did something I’ve never done before: I planned a week of meals using one cooking appliance: the new Crock-Pot® Express Crock Multi-Cooker. It’s a new product from the Crock-Pot® brand that helps you cook meals 70% faster than traditional cooking. Not only is it a slow cooker, but it is also a pressure cooker, a steamer, AND you can sauté in it. That right there is HUGE! With all of the functions it offers, I knew that I would be able to plan a variety of meals for the week. The first recipe on my menu plan is right here in this post: Chorizo and Kale Stuffed Sweet Potatoes recipe. 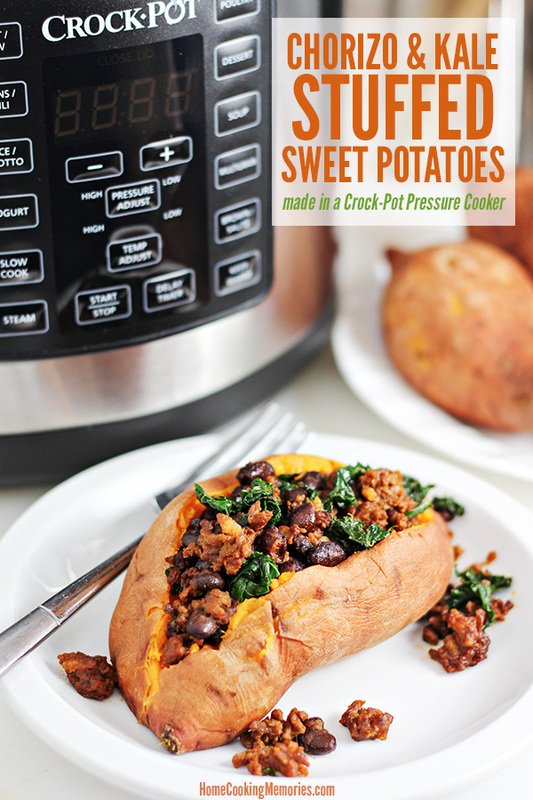 It might be hard to believe, but everything for this meal was made right in the Crock-Pot® Express Crock Mult Cooker — both the sweet potatoes and the chorizo/kale mixture. For this Chorizo and Kale Stuffed Sweet Potatoes recipe, you’ll only need 4 ingredients: sweet potatoes, kale, black beans, and chorizo. If you are unfamiliar with chorizo, it is a highly seasoned ground meat (usually pork). For this recipe, I used a Mexican chorizo which you should be able to find in the meat section of your favorite grocery store. This recipe has very little prep which is also nice when you are trying to get dinner on the table quickly. 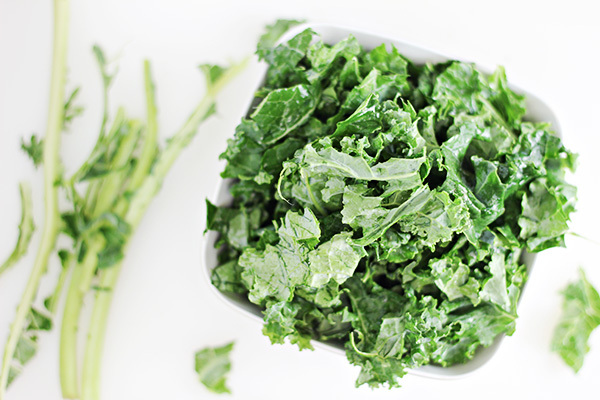 The only real prep you’ll need to do is tearing the kale into pieces and discarding the stems. You need about 3 packed cups of kale, which doesn’t take much time at all. Remove the lid from your Crock-Pot® Express Crock Multi Cooker and place the steaming rack (that comes with it) into the bottom of the cooking pot. 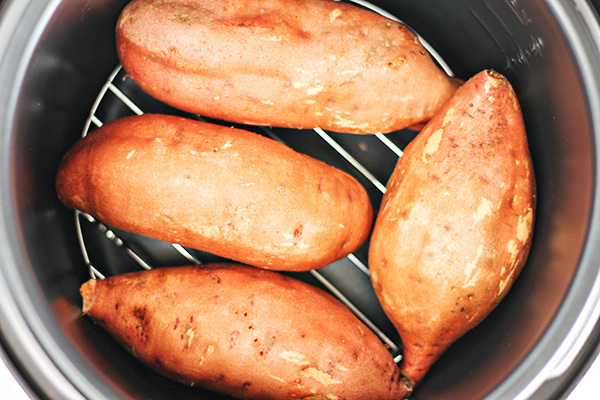 Give your sweet potatoes a good scrub and place them on top of the steaming rack. Add 2 cups of water to the cooking pot. Place the lid back on your Crock-Pot® Express Crock Multi Cooker. To do this, line up the arrow on the edge of the lid with the icon of the “unlocked” lock as shown in the top photo below. 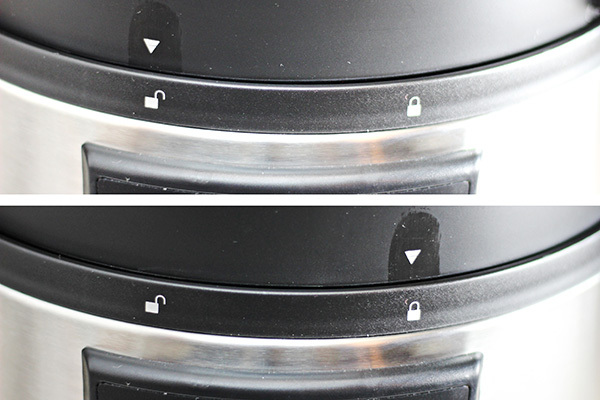 Then lock your lid by rotating the lid counterclockwise so that the arrow now points to the “locked” lock icon, as shown in the bottom photo below. Another important step when using your Crock-Pot® Express Crock Multi Cooker is making sure that your steam release valve is in the correct position. I find it very easy to know which one is correct with the little icons that are printed on the lid. 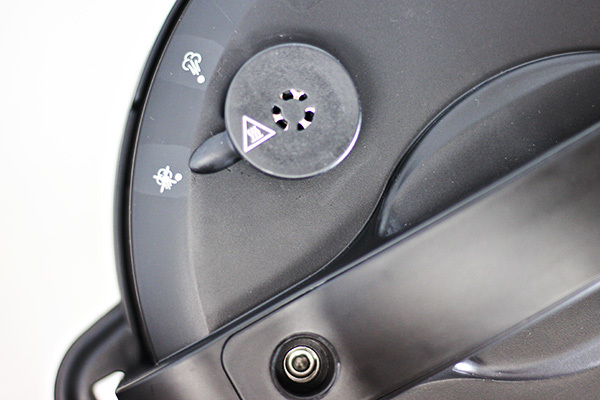 To build pressure in your Crock-Pot® Express Crock Multi Cooker, you must have the steam release value pointing to the seal position, as shown in the photo below (the one with the “X” over it). When you want to release pressure, you’ll use a kitchen utensil to move it to the icon without the “X” over it. 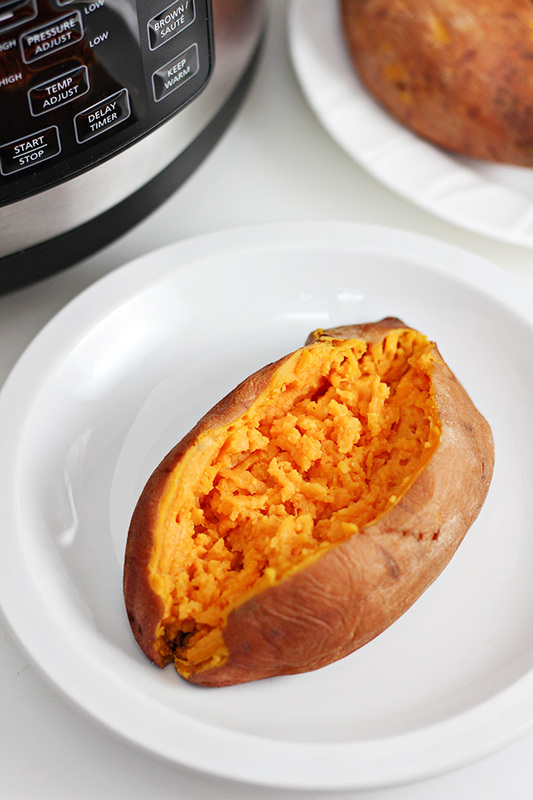 Now you are ready to steam your sweet potatoes. Press the “steam” button and using the “+” button, increase the time to 16 minutes. In our testing, this was the perfect amount of time for sweet potatoes that are about 8 – 11 ounces each. Finally, press the “start/stop” button to start the steam function. At first, you’ll see the word “heat” on the display (as shown below). Once pressure has built up, the word “heat” will be replaced with a countdown of the time you set. 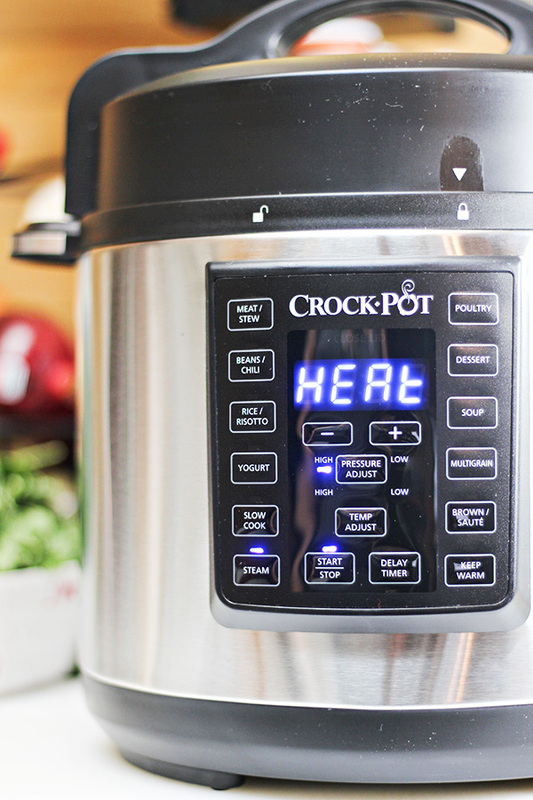 Once the sweet potatoes have steamed for 16 minutes, the Crock-Pot® Express Crock Multi Cooker will beep and it will switch to the “keep warm” setting with a new time being started. Allow the sweet potatoes to remain undisturbed for 10 minutes on the “keep warm” setting. At the end of that 10 minutes, you should be able to open your lid. If not, do a quick release of pressure by using a kitchen utensil to move the steam release valve to the icon without the “X” on it. Remove the sweet potatoes and set aside. Using pot holder, remove the cooking pot by lifting it straight up. Remove the steaming racking and pour off any remaining water from inside the pot. If you wish, you can rinse your pot to prepare it for cooking the chorizo. Place your dry cooking pot back in the Crock-Pot® Express Crock Multi Cooker and press the “brown/saute” button. Press the “start/stop” button to begin heating the Multi Cooker. While it is heating, it will say “heat” on the display screen. Once the temperature has been reached, the timer will begin counting down — this is when the Multi Cooker is ready for you to add your chorizo. Using a plastic or wood spatula, cook the chorizo, breaking up the larger pieces into smaller pieces. Once the chorizo is almost completely cooked, add the kale. Combine it with the chorizo, until it has become wilted and bright green. 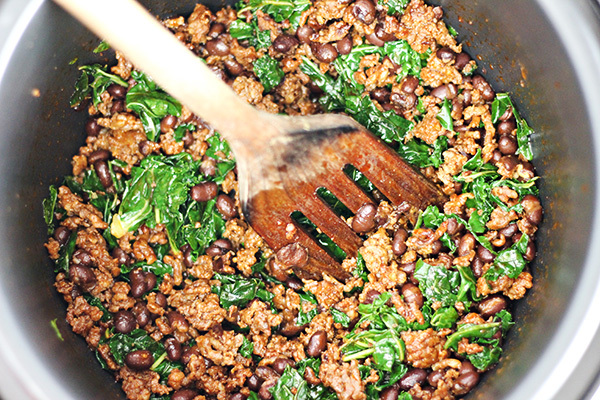 Add the black beans and gently combine them with the chorizo and the kale. Press the “start/stop” button to stop the cooking. 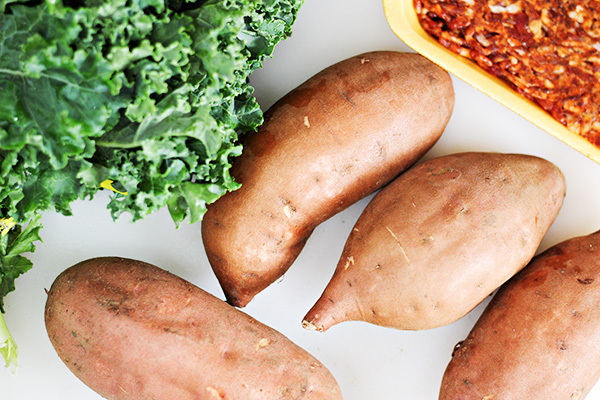 To build your Chorizo and Kale Stuffed Sweet Potatoes, place a sweet potato on a plate and cut a line on the top from one end to the other (from pointy end to the opposite pointy end). Press the ends inwards a bit to open up the sweet potato. Using a fork, fluff up the sweet potato. 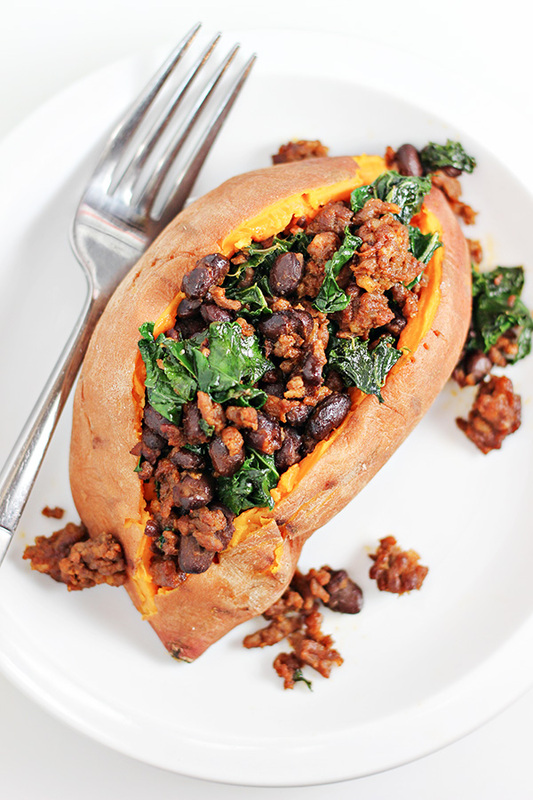 Spoon your desired amount of the chorizo and kale mixture on top of your sweet potato and serve! It’s really that simple. 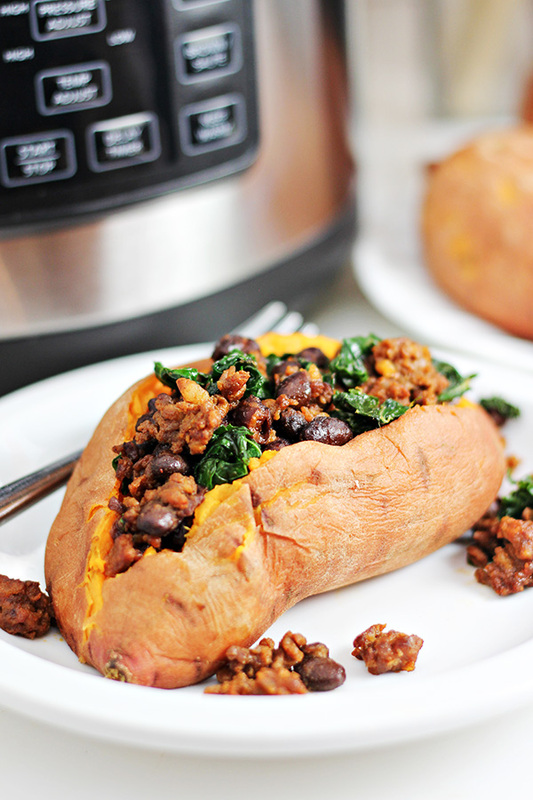 The chorizo, kale, and black beans perfectly compliment the sweet potato, making for a very flavorful meal. If you’d like to make this recipe, see the bottom of this post for the full recipe, including options for printing. Would you like a chance to win your own Crock-Pot® Express Crock Multi Cooker? I’m excited to be giving away one to one of my readers! To enter, use the Rafflecopter below. Leave a comment below and tell me what easy meal you would like to make in a Crock-Pot® Express Crock Multi Cooker. There are also several other ways you can earn bonus entries. Here are the additional meals from our menu plan which can all be made in Crock-Pot® Express Crock Multi Cooker. Don’t have one yet? 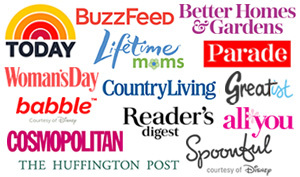 You can find the Multi Cooker at Crock-Pot.com, Target, Amazon.com, and Best Buy. Here is the full recipe, ready for you to print! Not ready to make this recipe yet? Be sure to save it to your Crock-Pot® or easy recipe Pinterest board or share on Facebook for safe keeping! 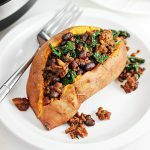 This Chorizo & Kale Stuffed Sweet Potatoes recipe uses only 4 ingredients and is perfect for a busy weeknights. Made in a Crock-Pot® Pressure Cooker. Place the steaming rack in the bottom of the cooking pot of the Crock-Pot® Express Crock Multi Cooker. Place sweet potatoes on top of the steaming rack. Add 2 cups of water to the cooking pot. Place the lid on the Multi Cooker and move to the lock position. Place steam release valve in the seal position (icon with the “X” over it). Press the “steam” button and using the “+” button, increase the time to 16 minutes. Press the “start/stop” button to start the steam function. Once the sweet potatoes have steamed for 16 minutes, keep in the “keep warm” setting for 10 minutes. At the end of that 10 minutes, you should be able to open your lid. If not, do a quick release of pressure by using a kitchen utensil to move the steam release valve to the icon without the “X” on it. Remove the sweet potatoes and set aside. Using a pot holder, remove the cooking pot by lifting it straight up. Remove the steaming racking and pour off any remaining water from inside the pot. Rinse and dry your pot and return it to your Multi Cooker. Press the “brown/saute” button. Press the “start/stop” button to begin heating the Multi Cooker. Once the temperature has been reached and the timer begins counting down, add your chorizo to the pot. To build your Chorizo and Kale Stuffed Sweet Potatoes, place a sweet potato on a plate and cut a line on the top from one end to the other. Open up the sweet potato and fluff with a fork. 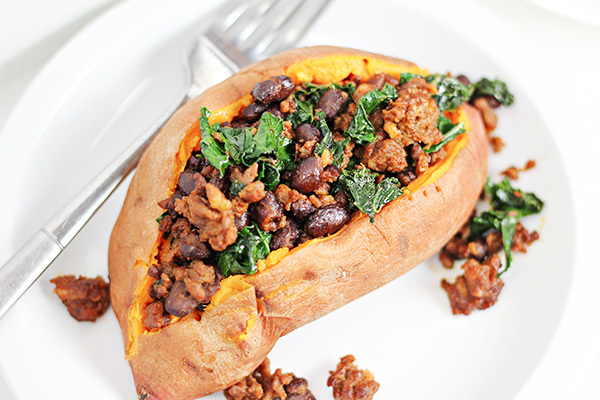 Spoon your desired amount of the chorizo and kale mixture on top of your sweet potato and serve! I would make garlic and ginger soup. Note to.self. stay off food blogs late at night..
First thing that popped into my head. Sloppy joe or my beef roast. I would cook beef stew. I’d like to make chili with beans in this! What a delicious idea! Thanks for sharing at the What’s for Dinner party! I’d like to learn how to make desserts in the Crockpot express pressure cooker. I’d love to use it to make a warm potato salad. Looks killer. Can’t wait to try it. This sounds so yummy! Pinned for later. I’d like to use the Crock-Pot Express Crock Multi Cooker to make shredded BBQ beef sandwiches! would love to make breakfast casseroles of all sorts!